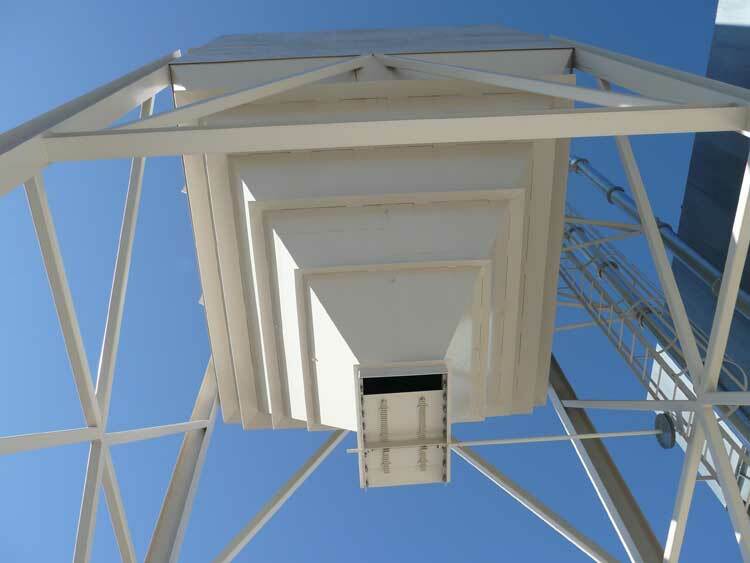 We offer a variety of Vent sizes to allow adequate air flow. 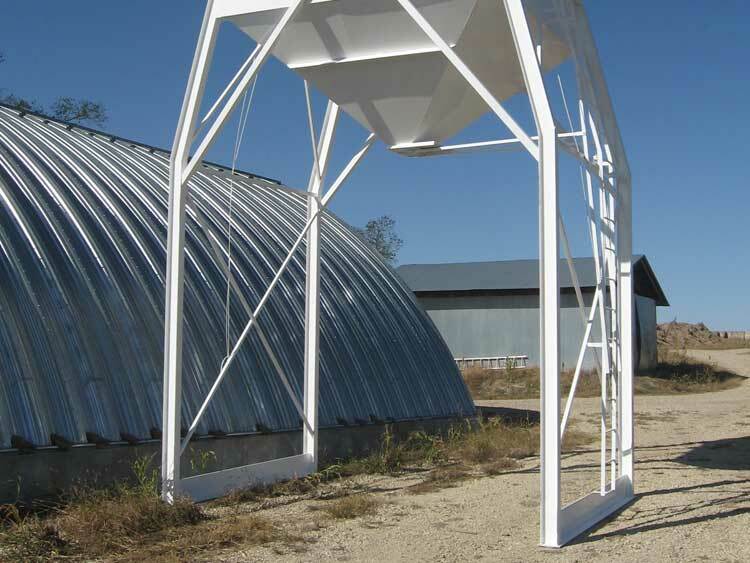 Larger vents are required where a grain leg is spouted into these bins. 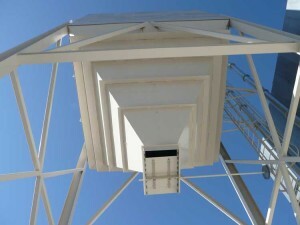 As the standard hopper slope is 48 degrees, another option available is a hopper with more slope. We realize many materials as DDG and Soybean meal require a steeper angle for better product flow. Note: When you increase the hopper slope you also increase the height of the bin. The hopper discharge can also be configured so as to align with what ever location needs to be met; as over mixer/grinders. To align with Auger trailer compartments for one stop filling. 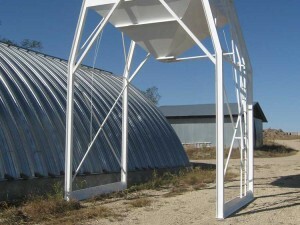 Bean Ladders and other seed handling accessories available upon request. As we have stated the 12 inch door is standard but again, we offer any size from 12 to 24 inches square or even rectangular doors for over grain cleaners/scalpers. Leverage slide, Rack and Pinion, Roller gates, Air and Electric…. The use of a sock is for bins with greater clearance and yet the sock controls loss from the wind because of dropping into a lower vehicle. These are easily removed and replaced on the bin. Some circumstances require extra width in the drive thru, thus we offer leg extensions. We will make leg extensions for the drive through width you need. Safety cages are available upon request where the ladder height requires such. Standard landings measure 24″ x 32″ and are located 8ft. above ground next to ladder. 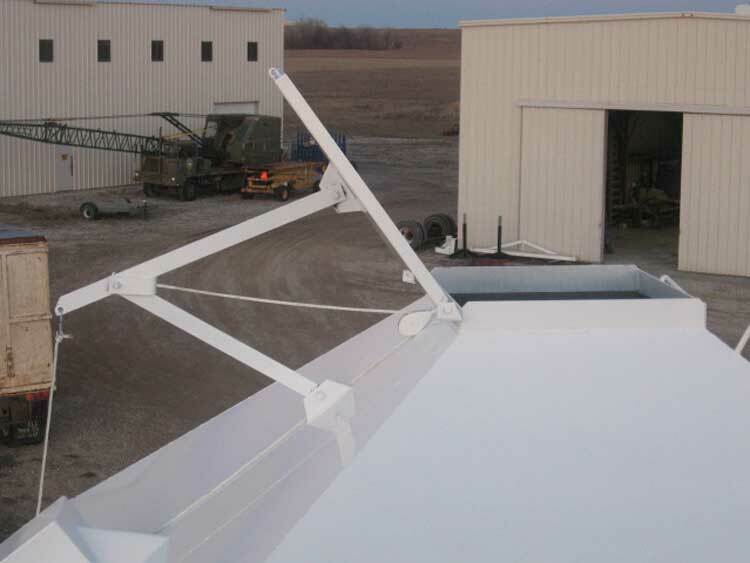 Provide additional safety for operator when loading grain trucks and semis. A must when bottom door is equipped with crank style opener.